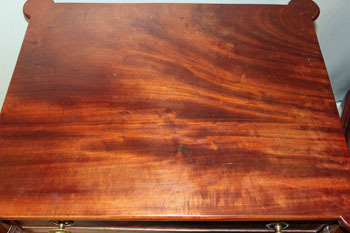 Finely grained Mahogany, with cookie corner top, fitted interior, reeded legs ending in a plumb foot, and a nice large bag drawer. Excellent condition in an old finish. Measures: 22 3/4" wide, 18" deep, 28 1/4" ht. All items 100% GUARANTEED as represented!